Is ActiveRain a Market Leader? Whether you are a veteran or novice of the real estate industry, there have been few more recognizable, not to mention Realtor-friendly, services over the last several years than ActiveRain. However, since its inception in 2006, ActiveRain has become more than just a simple blogging platform used by thousands of Realtors to market themselves and their communities. With Market Leader’s 2011 acquisition, ActiveRain will surely benefit from its vast financial, technological and industry resources, which could enable it to morph into a significant asset for today’s ever-increasing tech-savvy Realtors in an ever-changing marketplace. What kind of player? Well, first ask yourself why would Market Leader acquire a simple blogging platform like ActiveRain? What do they hope to gain and how does ActiveRain strategically figure into Market Leader’s already sizeable web presence including RealEstate.com, HouseValues.com, JustListed.com, Domania.com and SharperAgent? With so many great questions and so few answers, I thought, “How can we get these answers?” Why not just ask their CEO? So, I did. 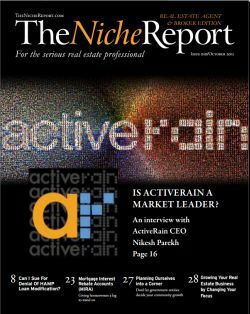 About a month ago, Nikesh Parekh was gracious enough to sit down and chat with me about the company since his promotion to CEO of ActiveRain in 2011. A well-educated, seasoned executive who is all too familiar with the benefits of infusing technology, real estate and finance, Nikesh has been employed by some of this country’s most thought-provoking companies including Dell, Credit Suisse, Second Avenue Partners, HouseValues and, of course, MarketLeader. : Tell me about your ever-winding road to ActiveRain. Nikesh Parekh: After coming out of business school (Harvard), I worked for a VC, CVC Capital Partners, which had invested in HouseValues, Inc. at a time when it was essentially just seven guys. In 2002, I left the VC and joined HouseValues with Market Leader’s current CEO, Ian Morris. Together, we grew the company’s revenue from $10M in 2001 to $100M between the years 2002-2007. At this time, we launched new products like GetListed and entered the hot and highly profitable mortgage business. However, in 2007, with the market showing signs of wear and tear, I helped Ian shut down the mortgage division and stabilize the company. In 2008, I departed and joined Madrona Venture Group as an Entrepreneur in Residence, which was an amazing opportunity and allowed me to gain invaluable expertise and insight. Not long after, in 2008, I was given a great opportunity to actually use my degree in Biochemistry while working for Bio Architecture Lab, where we created an intelligent process for converting seaweed into renewable biofuel. Within only a few years, we grew the company from just one person to over forty and raised $35M in capital. However, because I made frequent trips between our corporate office in San Francisco and Chile, I didn’t get much time to spend with my young family – that is, until a year later when I was offered an Executive VP position with Market Leader. In 2010, Market Leader invested in ActiveRain and then within a short year following, acquired the company and offered me the CEO position where I sit today, while also co-managing RealEstate.com which Market Leader purchased in March 2012 from LendingTree. : Long thought as one of the most natural and effective domains of our industry, how do you to plan to effectively utilize RealEstate.com? NP: Purchased originally by LendingTree in the late 1990’s, the original intent of RealEstate.com was to buy real estate brokerages and partner with others to essentially create a one-stop real estate portal. With natural traffic of 1M unique visitors a month, the original intent of the domain hasn’t changed; it always serves as a real estate referral website that generates considerable new business leads and creates great customer traction. : Speaking of “natural,” are there any plans to integrate ML’s suite of services into ActiveRain? NP: Slowly and carefully. In time, ActiveRain will have Market Leader’s suite of services in a very light way, and we’ve also discussed options with digital signature and transaction management providers. : With the resources of Market Leader, how will ActiveRain change? NP: Our focus will still be about servicing the wants and needs of real estate professionals, unlike Zillow and Trulia who cater more directly to consumers. This dedication has enabled ActiveRain to generate 2M+ consumer visits a month in part because of our 5M pages of content created by our Realtor network. Moreover, other industry professionals including attorneys and mortgage brokers find we have a fast and easy platform where they can simply collaborate; and now with Market Leader, we possess the effective capabilities of successful lead generation as well as tighter CRM integration with prospect managing and ActiveRain’s blogging. : You hear more and more Realtors talking about IDX technology. Do you offer this service? NP: Yes and, in fact, we are the largest providers of IDX websites with over 400 MLS companies, 100,000 agents and some of the biggest brokerages including Keller Williams and Century 21.
: I know Market Leader offers website development, but will you be joining Zillow in price? NP: While they offer cheap websites, our key value includes the aggregating of over 300,000 real estate professionals into a unified blogging platform. To accurately prove our value, we surveyed all our members on services price point, ROI in comparison to income generated and costs incurred on websites and what regions of the country were stabilizing. Take a look at the InfoGraphics and you’ll see some fascinating and effective data. : Because of a slowly recouping market, partly due to a serious lack of professional trust, have you ever considered creating an “Agent Review” or Verified Agent service through ActiveRain? NP: We thought about it, but we find our current point system best demonstrates how engaged our real estate professionals are on the site and discussing their community. A proxy for agent experience. : With 300,000+ agents blogging about their experiences and insight, do you offer coaching? NP: Actually, ActiveRain doesn’t need to, as the largest community of real estate professionals connecting and bettering content discovery (5M pages), but Market Leader does offer the IMSD (Internet Marketing Specialist Designation) program run by industry leaders Ben Kinney and Geeky Girls. : Are you planning any future integrations, and how about adding mobility capabilities? NP: With 5M pages, our core focus was to create better stability on ActiveRain, and currently we’re redesigning and rebuilding the website integrating HTML5. While our websites are built to recognize mobile phones, mobile access to our CRM and other services will be something on the horizon. : Now, for a touchy subject… ”grandfathering.” Can you provide me some insight on what happened? NP: ActiveRain was a free site launched in May 2006 by Jonathan Washburn. It grew dramatically and, as such, raised capital from HouseValues in the Fall of 2007. By the Fall of 2008, we went through most of the financing and needed to find a way to make additional money, so we introduced a premium blog called RainMaker. As a way of showing our appreciation to many of the original bloggers who joined prior to February 2009, they were grandfathered and were given free blogs. However, in order to keep their free blog, a member had to blog at least once every three months, and write at least one public blog. It became apparent that some agents, while busy running their practices, were surprised after not logging in for several months when they were asked to pay for the blog. We quickly corrected the matter and grandfathered members who called in with their free blogs. We certainly wanted to do the right thing for the original bloggers as they invested a lot of time and energy. It ultimately came down to a decision between running a viable business and doing what is right for the members. Unfortunately, due to scheduling conflicts, we missed each other, but in his place I met with the intelligent and extremely capable Sarah Daniels, Market Leader’s Chief Marketing Officer. : With such a diverse background, what brought you to MarketLeader? Sarah Daniels: I spent a considerable amount of time with technology companies and was always interested in bettering the experience. In fact, at one point in time, I was involved with children’s software and that gave me a real appreciation for a “Keep It Simple” perspective and approach. I found that if clients are taking too long to understand or learn our software, we’re doing something wrong. In this industry, if I can’t walk in the shoes of both novice and seasoned Realtors, I’m not doing my job. : As much as I’d love to try out your CRM, what can you tell me about it? SD: Again, we take a “Keep It Simple” approach. A real estate professional’s job is to be connecting with buyers and sellers and to make the process simple for their clients. Their job is not to learn complicated software, so when we put out software we are trying to walk in our customer’s shoes, no matter whether they’re a younger, out of college digital native or an older Realtor who is getting acclimated to computers and software. To aid our members, we also created a directory of short videos explaining various modules of our software. We found that if our clients were spending more than five minutes learning how to use any part of our software, then we made a mistake. NOTE: At this time, Sarah walked me through different parts of ML’s CRM system, which I found very simple, and I was astounded at the sheer volume of their 4,000-template library. : Who do you consider as your competitors? SD: Niche solutions. There are many different small companies that provide individual products or services, but no one really has created a suite like ours. I think at some point in the future these small companies will disappear. I do think that Zillow and Trulia may be considered a competitor, but again, that’s in the future. Conclusion: As an active SM professional, I am blessed to have many friends who are among the cream of the crop in electronic networking; however, many of these professionals share my unyielding commitment to being what I call, “H.O.T.” (Honest, Open, and Transparent). With that said, I’ve recently noticed a discussion trend relating to ActiveRain, and it’s clearly one of pessimism regarding the website’s ability to market Realtors since its acquisition by MarketLeader. While ActiveRain markets that they have 300,000 registered members, how many of those members are still involved in publishing content or using the platform for current marketing? On the other hand, we must not discount their multi-faceted resources. So, in conclusion, with the recent strategic acquisitions made by Market Leader, will Realtors finally have a powerful, web-based, one-stop solution to help them build their businesses and market new leads? While I think that they already have a plethora of solutions, competition in our industry is fierce and can change in a New York minute. So, who is the next big player in town? We’ll explore that and more in the next up-and-coming edition of TNR. Interview conducted by Jeff Chalmers, a 20+ year veteran of the real estate industry, Inman Ambassador and Vice President of Mortgage Lending for Guaranteed Rate, Inc., the nation’s fastest growing mortgage company. A serial tech entrepreneur and industry finance and closing expert, Jeff has facilitated over 15,000 residential real estate loans worth about $5B. Additionally, he networks with many of the industry’s most effective and gifted social media leaders and web developers. He can be reached at 774-291-6527 or jeff.chalmers@guaranteedrate.com. 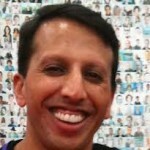 You can also visit him online at www.ClicknFinance.com, and follow him on Facebook or Twitter. All of Jeff’s comments are his own and are not those of Guaranteed Rate, Inc.